The MLP structure could be a broken model. Somehow a $9.3 billion deal went relatively under the radar of many investors last week as Tulsa, Okla.-based natural gas storage and transportation company Oneok (OKE - Get Report) announced it would acquire its affiliated master limited partnership, or MLP, Oneok Partners LP (OKS . Though the transaction wasn't greeted with much in the way of Wall Street headlines, the deal signals what is becoming increasingly apparent in the oil and gas business: the MLP structure, one that is set up much like a real estate investment trust, may be a broken model. To be sure, Oneok saw its shares rebound around 165% in the past 12 months as commodity prices came off the bottom, and it was likely looking to use its currency for a deal, Hinds Howard, an associate portfolio manager at CBRE Clarion Securities, ventured. A deal to acquire its MLP and eliminate the partnership's pesky IDRs in the process may arguably have served as something of a two birds, one stone device. But according to industry sources, IDRs are across the board less attractive in the current industry environment, with oil just above $50 per barrel and natural gas heading back toward $3 per million British thermal units—much less attractive than when these mechanisms were in vogue at $100 oil and $6 natural gas—making the MLP in turn less attractive to many investors. The second, more glaring factor that Oneok may have been looking to get in front of, is potential tax reform by President Trump. Industry watchers speculate that Trump could impose reform that would make C-corp structures more appealing or even cause double taxation on MLPs, one at the corporate level and the other at unit-holder level, making the structure that much less lucrative for everyone involved. 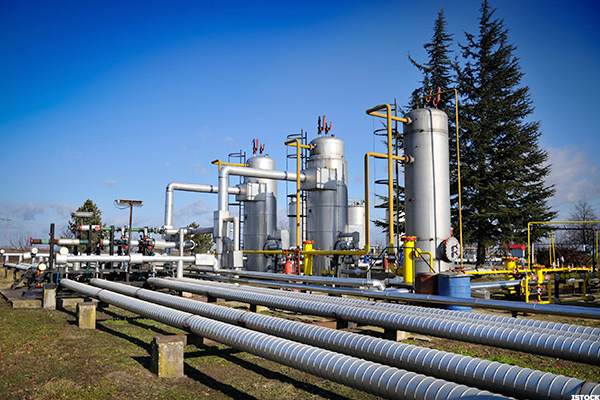 Following last week's announcement, CreditSights analysts noted investors will naturally be wondering what the Oneok deal means for Energy Transfer Equity LP (ETE given that it is now the last large pure play holding company that hasn't addressed IDRs. There are actually quite a few other MLPs that have yet to address the issue of IDRs, though, not the least of which is ETE and its affiliate Sunoco Logistics Partners LP (SXL . But SXL first has to work out the acquisition of its sister MLP, Energy Transfer Partners LP (ETP . Whether in fact the company will eventually go the route of Oneok and Kinder Morgan (KMI - Get Report) , opting to gobble up the entirety of their MLP to effectively simplify their structure and wipe out the IDR altogether, or restructure its IDR while remaining a separate MLP is anyone's guess (though the better bet is probably on the latter). Stifel's Akyol and Brungardt claim that at 38%, Sunoco Logistics has the highest percentage of its distributions flowing to its general partner after forgiveness rolls off in 2017. And the firm estimates Sunoco Logistics has one of the highest equity costs of capital at around 14.2%. ETE management recently announced a so-called simplification transaction in which Sunoco Logistics would merge with its sister MLP, ETP, in a deal valued at $20 billion. But the IDR remains intact, and Stifel expects it to continue to weigh on the partnership's balance sheet post-merger. Meanwhile, at 9.9%, Tallgrass Energy Partners LP's (TEP) cost of capital is also high compared with that of its peers. The company, whose general partner Tallgrass Energy GP LP (TEGP) is publicly traded, has rapidly grown into the upper tier of the IDR structure, according to Stifel, which estimates the company will pay 35% of its available cash flow to its GP in 2017. "Although the partnership's sponsor has several assets remaining to drop down to TEP, we expect management to focus on organic growth following the final dropdown," Akyol and Brungardt wrote, referring to when parent companies sell assets to their MLPs. "As TEP transitions to an organic growth model, we believe management should seriously contemplate executing an IDR buyout in order to lower the partnership's equity cost of capital." an elevated level which often reaches 150% of the current yield. The current yield of an MLP is the current declared quarterly distribution annualized divided by current stock price. Other names paying 35% of their distributions to the GP include Western Gas Partners LP (WES - Get Report) , with 8.6% cost of capital, and Phillips 66 Partners LP (PSXP - Get Report) , with a 6% cost of capital. With 33% of its distributions going to its GP and a 6% cost of capital, EQT Midstream Partners LP (EQM - Get Report) also is a name to consider for an IDR restructuring or buyout in the future. Western Gas Partners is a unique case, according to Stifel, given the MLP's constant support from its sponsor Anadarko Petroleum (APC - Get Report) . Anadarko has absorbed Western Gas' common equity issuance, dropped assets into the MLP for zero upfront cash and is making direct capital contributions to fulfill legacy contracts and cash flows on a quarterly basis, the analysts noted. Considering this, Western Gas' IDR may be around for some time.Western Gas also has been a staunch defender of the IDR structure, but as CBRE's Howard points out, so was Oneok. Given how far Oneok's shares had run up and the premium its stock was catching compared to that of its MLP, maybe it was hard to argue against an MLP buyout. Other MLPs with similarly stellar rebounds in the past year include Enlink Midstream LLC (ENLC), which has come up 107% in the past 12 months. The shares of Enlink's MLP, Enlink Midtsream Partners LP (ENLK), are also on a tear in the past year, though, and are currently valued above those of the company's sponsor, making an MLP buyout hard to imagine in the near-term. Not to mention, ENLK is only paying 12% of its distributions to its general partner, giving it plenty of time to mull its options.